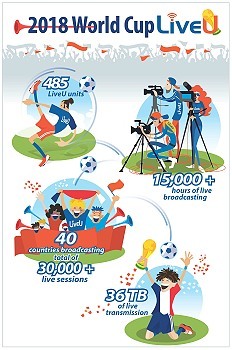 LiveU delivers 15,000 hours of transmission during FIFA World Cup. Hackensack, NJ, July 2018: LiveU released its live broadcasting figures during the FIFA World Cup™ in Russia with 485 units onsite used by customers from over 40 countries. The numbers have doubled, and even tripled, since the 2014 FIFA World Cup™ – including over 15,000 hours of live broadcasting, over 30,000 live sessions and 36TB of live transmission – with LiveU’s LU600 4K HEVC solution enabling customers to broadcast more hours with less data. Customers used LiveU to follow the teams, interview the players and the fans, and capture the atmosphere with daily live feeds. LiveU was able to provide customers with bandwidth guarantees for superior connectivity in the 12 host cities. The offering provided a special add-on priority SIMs package for streaming high-quality live video, enabling customers to reach 20Mbps uplink and deliver HD live feeds even from the most crowded locations. LiveU had a dedicated technical team on site, managing the logistics and providing 24/7 support, with two designated distribution centers in Moscow and St Petersburg. The project was overseen by the company’s local partner MediaProject Ltd.